Most legal systems today have an anthropocentric view, meaning that animals are still things and are under complete subjection to the will of men. Nevertheless the necessity of attribution of legal capacity to animals and to create a new legal status is clear. Whilst science and philosophy have been able to evolve in animal rights, by proving they have rationality and experience feelings, the law has not. But the law should be the right tool to approach a new consideration of animals and create a new concept of legal system which is biocentric and not anthropocentric. In Italy the first provisions regarding animals were comprised in the Zanardelli Code of 1889, which stated that whoever became cruel to an animal was to be punished with a fine. These provisions, though, targeted the protection of humans from inconvenient feelings of disgust in front of a cruelty scene, not the protection of the animal´s welfare. The last revision of the Italian Civil Code, in 2004, still defined define the animal status in the Italian legal system. In Italy right now, there still is a very complex framework. Although we can see an animal attitude in this framework, it is not enough to give animals subjectivity. Still animals keep on being excluded from legal capacity and this is an unconceivable discrimination. Animals should be included in the Italian Constitution; the animal dignity should at least be present in the form of a mediation between human and animal interests. Revision right now i s the only way to improve the legal system. To understand the necessity and the reason behind EU animal welfare policies we have to start with some facts. In Europe there are 12 million sows, 360 million laying hens, 330 million eggs are consumed and processed every day, 10 million chickens are slaughtered per day, and so are 1 million cows, sheep, horses. Regarding transportation, the statistics show that the animals being transported every year for more than 8 hours are 4 million cattle, 28 million pigs, 4 million sheep, 243 million chickens, and 150.000 horses. It is therefore evident that animal welfare is and must be a priority for the European Union. According to the OIE definition of welfare, welfare means how an animal is coping with the conditions in which it lives. To this regard, EU policies have to follow five key principles, also called the five freedoms: 1. the freedom from thirst and hunger; 2. from discomfort, 3. from pain, injury, and disease; 4. to express normal behaviour; 5. from fear and distress. The first legislation on the matter was introduced in 1947 for the protection of animals in slaughterhouse and in 2009 a very important step has been achieved: the art. 13 of the Treaty of Lisbon states that animals are "[...] sentient beings, pay full regard to the welfare requirements of animals [...]". In recognition of this the European Commission has adopted new strategies to improve welfare conditions for animals kept in farms, living in zoos, and used for experiments (not for pets, because not economically relevant, therefore not part of policies to harmonise the common market). But changing value to add value goes through a process, it is not immediate. 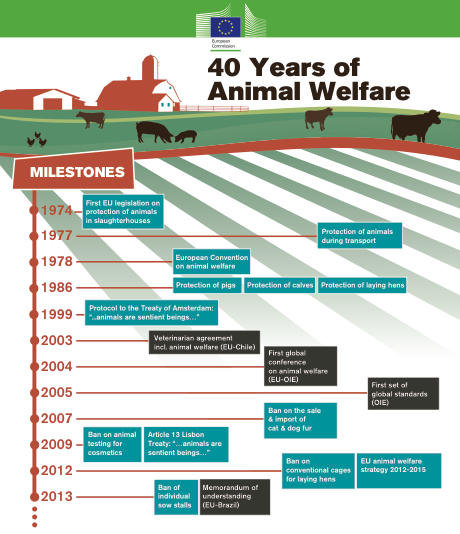 The first step is represented by a change in the values of society and a related response, followed by the scientific development of new animal welfare indicators. Then there are new market drivers and the integration of animal welfare with the sustainable agenda, followed by a holistic approach, which can finally establish new relations between producers and society. Under the guiding principle of "everyone is responsible" the new strategy has a multi-layered approach, oriented to enlarge the scope of EU, spread animal welfare indicators, spread information to consumers, create a network of reference centres, and guarantee more competence and education.